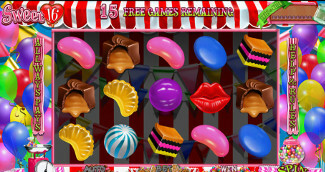 Slot Machine Sweet 16 - Probably Not What You're Expecting! Get lucky with free spins. The title of the cute Sweet 16 video slot by RTG may be a bit misleading. It is not a slot game themed around lavish birthday parties of 16-year-old girls, complete with convertible automobiles, new iPhones and a ton of presents. Sweet 16 is all about candy – sweet, mouthwatering, colorful, munchy candy. In a way, the slot could be a nod to the MTV reality show hit called My Super Sweet Sixteen, but instead of depicting outrageous sweet 16, quinceanera or coming-out parties, Sweet 16 shows us candy rivers, showers and piles, without omitting close-ups of swirly lollipops and creamy toffees. As children, we all loved to go to the candy store and pick through differently flavored and colored candy. Sweets are a guilty pleasure that even adults have and indulge every now and then. When we get older we often consider candy a prize for some achievement and allow ourselves to get full on cakes, cookies and sweetmeats. Sweet 16 goes for a lean, pastel look. The background is pink and purple (what a surprise), with yellow reels. It seems like there was an explosion of a piñata in the background because you will see hard candy, lollies, bubblegum and strawberries flying around. Other candy stuck to the reels, you just have to click on Spin and reach them. 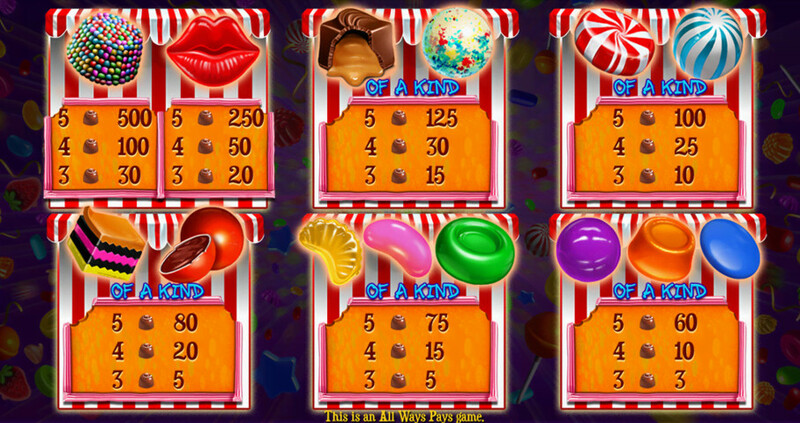 The game has a Candy Crush Saga vibe, but instead of solving a puzzle adventure, here the players must defeat their own sugar cravings. 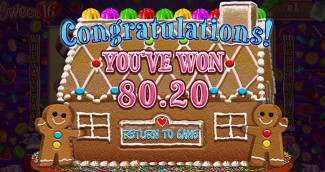 The game is a danger for those with a sweet tooth, as well as those who try to stay away from sweets and in shape. If you’re not in any of the categories – dive in! The Special Feature doesn’t look much different but sure does kick some money your way. 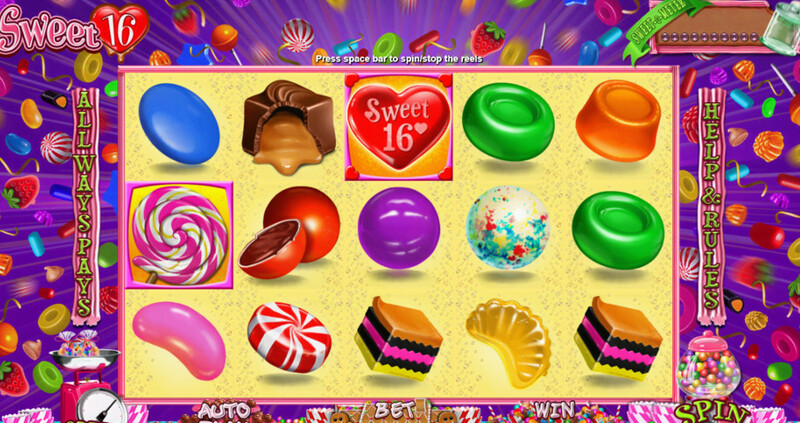 While it not appears as a badass slot, Sweet 16 has a lot of great gambling ingredients. It is an easy slot to play. For one, it applies the most popular layout, the 5×3 reel frame. The format allows 243 ways to win, where all wins pay left to right. No need to memorize all the paying lines, because there aren’t any. You just need to match adjacent symbols for a sweet, sweet win. The control panel is quite funky with a speed meter where you can adjust the pace of the gameplay, a flashing Autoplay option, and a pink Spin button. Mobile users will appreciate the layout perhaps even more than desktop gamers. To start spinning, the bettor is required to set the bet value. Then, the action can begin. The coin range starts off with $0.25 and it goes up to $6.25. Since the interface is cluttered with imagery of candy in various shapes and sizes, it won’t take much to get a sugar rush. Don’t get disappointed after looking at the paytable, thinking that the prizes are somewhat limited. 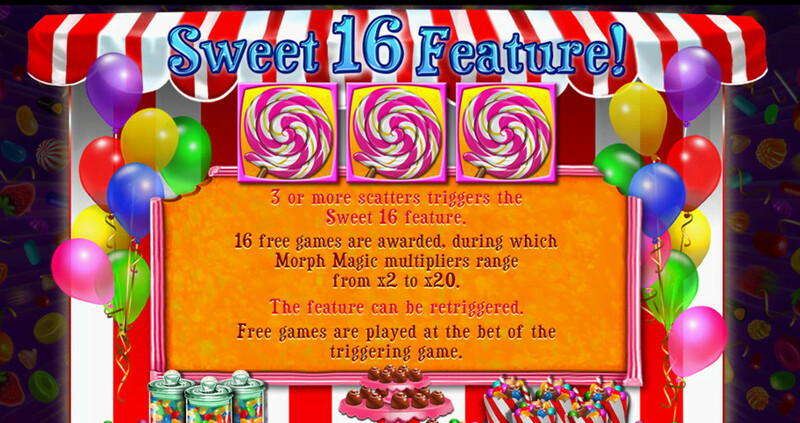 Sweet 16 is jam-packed with feature goodies which compensate for the lack of payout potential in the base game. Some of the symbols seen both in the paytable and on the reels are wine gums, toffees, jelly beans, lollipops, bonbons, acid drops and chocolates. The Wild Symbol is the Sweet 16 logo. It appears on reels 2, 3, 4 and 5, exclusively. Grouped Wild Symbols is a common occurrence, meaning you can win more than you expect from a Wild-induced combo. 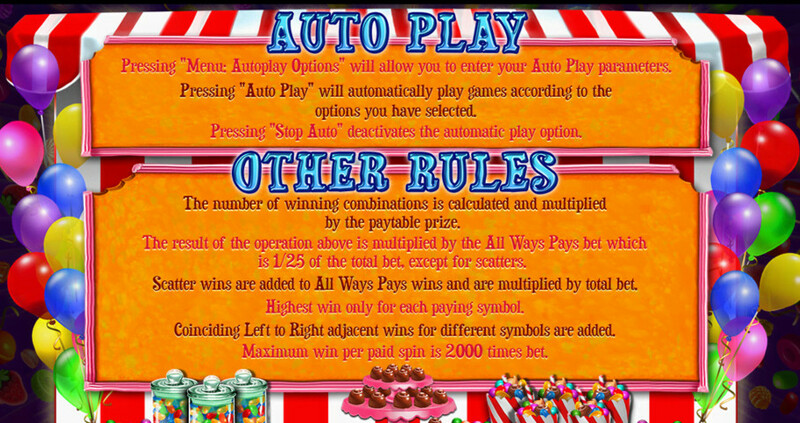 Sweet 16 is laced with a unique game system where winning symbols immediately get morphed when the win is paid. That means more wins on a single spin. Big Wins waiting for you. 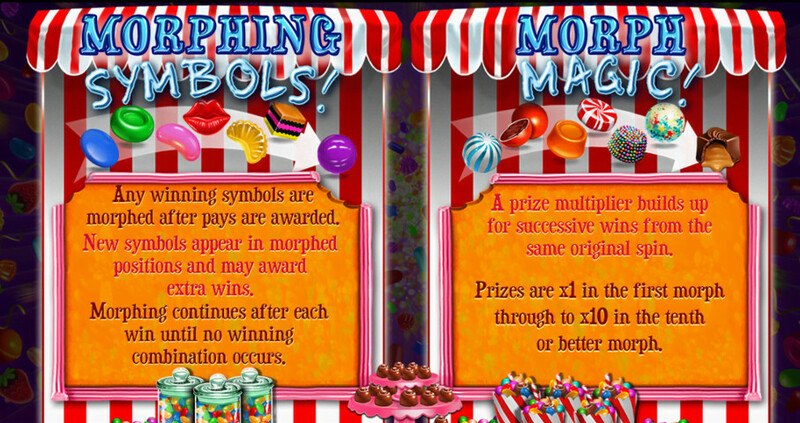 The free spins mode will be available when 3 or more lollipop symbols land on the reels. The game awards 16 freebies with morph multipliers. 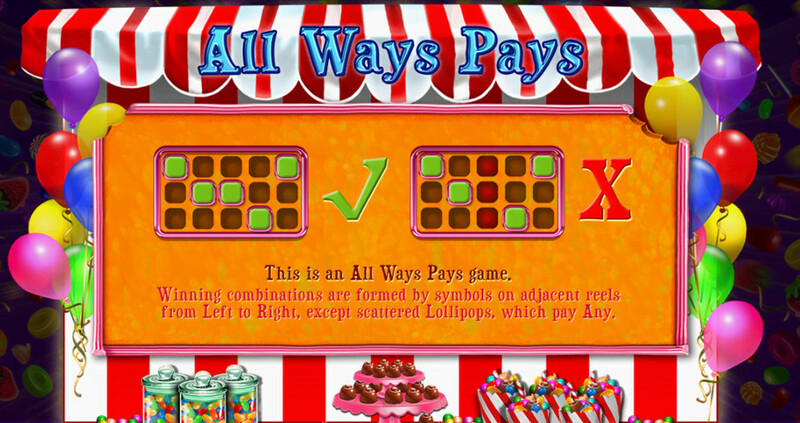 Multipliers are active throughout the feature and could boost your wins from 2x up to 20x. It’s hard to believe that something can be even sweeter than it appears, but have a go at Sweet 16 and then give your feedback. Of course, some players may find it a bit too flamboyant, garish even. It is what it is, a slot with fantastic gameplay and rewards, with a payout percentage of 96.3%, a top non-progressive cash prize of 5,000 coins and low to medium variance. GoodCasinos.org is for entertainment only. No gambling takes place on this website. Online gambling may be illegal in your location. Please check and obey all local, state and federal laws before doing anything on the internet, especially when it comes to online casinos. All information is for entertainment only and we are not responsible for the validity or accuracy of the content and or the comments posed by visitors. While our team strives to keep the information up to date and accurate we do not guarantee any accuracy of the content. By use of this site you agree to hold us 100% harmless for all reasons. Play at your own risk. Most players lose money. Only gamble responsibly with money that you can afford to lose. We do not collect any personal data. We do use google analytics and statcounter to collect general data about all visitors but nothing personally identifying. We wish you best of luck gambling online! © 2019 Good Casinos, All Rights Reserved.